Yet now just a few days later, Harrison says he's fine to play in Round 4. The scene at Skilled Park last Saturday night was not an uncommon one in Rugby League. 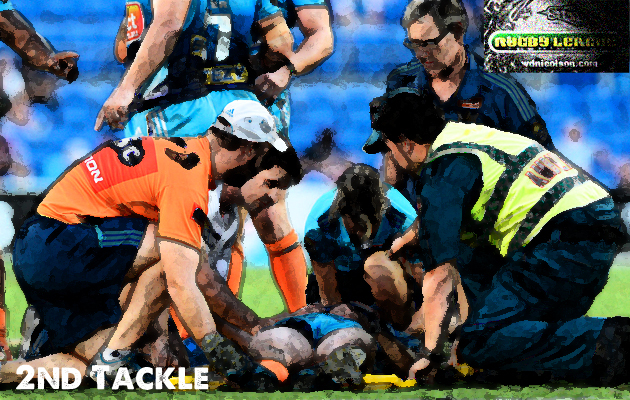 Gold Coast Titan Ashley Harrison lay prone on the ground being attended to by club medical staff and most people watching on were praying that the 31 year old would be able to get up. The good news was that he could move his arms and legs, but he would leave the field of play on a stretcher and not return to the game - his 250th in the NRL. Manly forward Richie Fa'aoso was put on report for the shoulder charge - that was more late than it was vicious and the nature of pass that Harrison had just made means that his body 'switches off' from its normal 'flexed' state... so when Fa'aoso hit Harrison - he shook him to the core. Yes there was a head clash after the initial shoulder to back contact but it was not intentional on Fa'aoso's part to hit Harrison above the torso. But given he did and the way Harrison fell to the ground - clearly in trouble - means that Manly will be without Fa'aoso for 3-4 weeks depending on whether he chooses to challenge his charge from the NRL Jokediciary. All Votes from the first 7 games of Round 3 are below. But this is not about what Fa'aoso did or didn't do - it is about Harrison's welfare. Harrison has told The Gold Coast Bulletin he will play this weekend... if allowed. "For sure (I'll do everything I can to play). I've been knocked out plenty of times and in the past years you'd just line up (the following week) and away you'd go," Harrison told the Bulletin. "I'll see what the new processes are and we'll go from there." So what are the processes? Best anyone can tell - the NRL does not encourage club doctors to let concussed players return to the field during the match they are injured, and the same applies for the next week... unless they pass tests. Hang on, that's the NFL... or is the NHL? Point is - I'm not 100% sure, and I'm certainly not sure about the NRL's actual policy. So I Googled it... and here it is. Concussion is a disturbance in brain function resulting from trauma that is transmitted to the brain either directly or indirectly. Complications can occur if the player is allowed to continue playing before they have recovered from the concussion. Therefore a player who is suspected of having a concussion must be taken out of the game or training session immediately. Such a player should not be returned to play in the same game. Therefore it is imperative that all players with concussion or suspected of having a concussion need URGENT medical assessment. 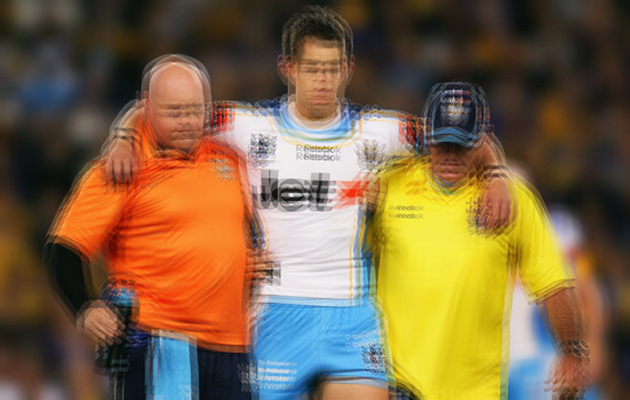 In the period following a concussion, a player should not be allowed to return to play or train until they have had a formal medical clearance. From what information that is around from Harrison's mouth ("I've been knocked out plenty of times") and the NRL's policy - Harrison appears to have suffered a concussion at the point of impact. But will he play this weekend? That's where the NRL policy gets slightly grey... there is no hard and fast rule if a player gets knocked out or concussed... as in they can't enforce a player missing a game no matter how badly he was knocked out or concussed. Wait you say - there's a difference between being knocked out and a concussion? Technicalities are huge when it comes to sports injuries (notice that the GC Bulletin article never used the word 'Concussion' yet a quick check of the Titans site found it used in text and by their club physio - note: after this article was finished I found this) - given the money that is wagered on the NFL - they have specific rules on players eligibility for each weekend (I'm sure you've heard the terms 'Questionable, Doubtful, Probable' etc?). Now had Harrison said 'I've been concussed plenty of times in my career' then odds are he wouldn't be playing this weekend, but because he chose to use the words 'knocked out' - he's a big chance of convincing club doctors to clear him. NOTE: A quick check of the Titans site found their Rehab Report which suggests Harrison DID suffer a "Serious Concussion" per their physio yet the below still remains true - it'll be up to Harrison. And the only way club doctors can clear him is if Harrison says he is okay to play. That is - not concussed. "I'm fine today," Harrison said on Sunday. "I didn't have any headaches or anything." Wondering how the NRL defines 'Concussion'? Now I like Ashley Harrison - he's a stand up guy and a player who is one of the first picked for the Queensland State of Origin team. This piece is not about Ashley Harrison as much as it is about what happened to him last Saturday... but should he be playing this weekend? 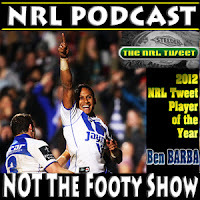 Well that's not up to me, the NRL or even really his club doctors. If Harrison tells them he's fine and symptom free and passes the cognitive tests - regardless of whether or not he had a 'severe concussion' - he'll play. But one gets the feeling after watching him laying on the ground incredibly unwell last Saturday at Skilled Park - he shouldn't. Do you think the NRL should make a clear rule that if you leave the field obviously concussed (the NRL's medical people would HAVE to set up a standard on-field test FIRST to have a hope of enforcing this) then you cannot play within 5, 6 or 7 days of your next game (or have a mandatory game off?)? Would love to hear your thoughts on what is a sensitive but potentially life saving issue. Is a game of footy worth risking a career and possibly a life? PS. I sincerely hope Ashley Harrison is 100% fine today and never has any issues in the future, but I have yet to even scratch the surface on the impact of concussions that go un-rested in the NFL and NHL in particular. For interest's sake - check out this standard post-concussion management process. Do you think Harrison should be the one to decide if he plays this weekend? Keep a lookout for the rest of the 3rd Set of Six on www.wdnicolson.com published on Tuesday.